Lower Level Fully finished with high ceilings, oak floors, spacious living room/ media room with gorgeous built ins, wet bar, full bath and another spacious finished room to be customized per buyers discretion. Full exterior stairwell access. Sold with approved building plans. Building permit in progress. 4 bedroom septic installed. Town water. Views of Miacomet Golf Course .. Located in the well established Pine Valley neighborhood, this four bedroom home was completely renovated in 2018. The mature manicured .. 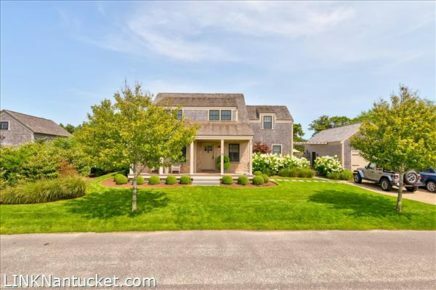 This property is ideally situated between mid-island conveniences and South Shore beaches, and is just moments from Nantucket Land Bank .. Exceptional Location! This property is perfectly positioned to enjoy stunning views over Miacomet Pond to the ocean. Private and peaceful, ..
Close to Miacomet Golf Course, Bartlett’s Farm, and the south shore beaches this half acre lot has a wonderfully built .. Located just moments from Miacomet Golf Course, Bartlett’s Farm, Cisco Brewers and some of the islands favorite beaches, this three-bedroom ..
Cape style home nestled between Miacomet Golf Course and Bartlett’s Farm. Enter into a cozy living space that flows into ..
Immaculate 4+ bedroom home situated next to the 18th tee of the Miacomet Golf Course, complete with sweeping views of ..
‘The Preserve’ at Miacomet, thoughtfully and tastefully designed, taking full advantage of the surrounding pristine conservation land and the nearby ..
1/2 acre lot with nice elevation! Property location is convenient to Miacomet Golf Course, Miacomet Pond, Bartlett’s Farm, Cisco Brewery, ..